inVeritas Vice President of Public Relations Nathan Green was recently named to the Northwest Arkansas Business Journal's Annual Forty Under 40 class. The award honors 40 individuals who are making a positive difference in their professions and thriving in their communities. Beginning in 1997, the Business Journal has annually honored 40 outstanding professionals under the age of 40 who live and work in the six-county coverage area of Benton, Washington, Carroll, Madison, Sebastian and Crawford counties. They were nominated as best in class by their peers in all industries. This year’s class was chosen from more than 100 nominations, representing a variety of business industries in the for-profit and nonprofit sectors. Nathan joined inVeritas in 2011 and leads the firm’s public relations practice which includes marketing, digital media and brand management. 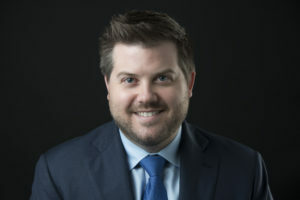 He serves as a strategic advisor for clients, including ACCESS, Amazeum, City of Fayetteville, Learning Disabilities Association of Arkansas, and Northwest Arkansas Regional Airport (XNA). Nathan earned his bachelor’s degree in economics from Saint Louis University and his Juris Doctor from UALR William H. Bowen School of Law. He is licensed to practice law in Arkansas. Read more about Nathan’s accomplishments in the Northwest Arkansas Business Journal.